Last week I was carrying on about Skillet Street Food, now wheeling and dealing outside Safeco Field on game days. And this week in The Stranger, Jonah Spangenthal-Lee offers a broad look at Seattle’s growing street-food scene. One set for the imminent arrival of two high-profile newcomers: Marination Mobile (“serving Hawaiian and Korean curb cuisine”) and Beecher’s pig-faced Airstream (promising “the best pulled-pork sandwich you’ve ever had”). Meanwhile, up north in my hometown, there’s another street-side sensation making the rounds. Last Saturday, while strolling past Tully’s on my way to the Edmonds farmers market, it caught me eye. 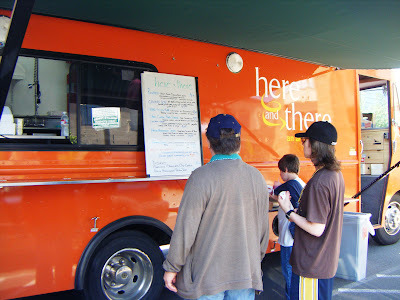 Say hello to Here and There, a rolling feast-mobile that markets a mighty fine pulled pork sandwich ($8.95) on a Columbia City Bakery roll, with fries on the side. That’s one smooth(ie) sandwich, but next time I’m trying the Reuben. 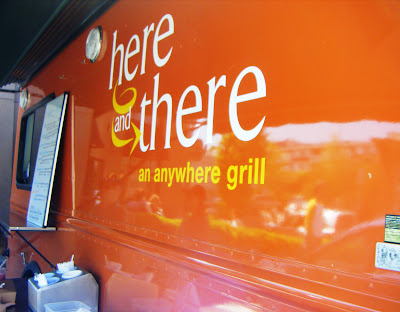 Here and There is owned and operated by Julie Malcolm, an Edmonds resident with a long history in the business, beginning with her New Jersey childhood. Her father, Charles Korten, worked for Campbell’s. “My dad invented SpaghettiOs,” she told me. And though some may dispute that as fact, there’s no disputing the SpaghettiOs-flavored hue of her converted step-van. Uh, oh! Anybody got a spoon? Julie’s dad, a food scientist for the company, later moved his family to the west coast after Campbell’s bought into the restaurant business. Here he ran food and beverage operations for the parent-company’s restaurants — among them Herfy’s, Clark’s and Pietro’s Pizza — before lighting out on his own with Edmonds’ (long defunct) Harbor House restaurant. Julie got her feet wet at the Harbor House and spent 35 years in the business, waiting tables and eventually managing dining rooms at the Washington Athletic Club and Arnie’s. You may know her as the owner of the late Cat’s Eye Cafe in West Seattle. The restaurant biz is clearly in the family blood. Her sister was the longtime manager at the J&M Cafe (and now works with Julie on her days off from her job at Swedish Hospital). Their brother owns the Clearview Cafe in Snohomish. Her professional lineage aside, it was Julie’s job as a Little League mom that has her thrilling to the grill, and on the move today. “After I had kids I volunteered, did catering at their schools and at the Pacific Little League concession stand at Lynndale Park,” she says, noting she’s also an accompished home cook and hard-core cookbook collector. During her seven-year tenure with the league she elevated the concession from a hot dog and candy counter to a menu-driven takeout stand with a full restaurant kitchen. With her kids now in their teens, she got on the wagon — literally. “I bought an old Matco Tools truck, built a mobile kitchen and got it painted,” says Julie, who spends three days each week taking her weekly-changing menu on the road. She sells sandwiches (Chicago-style hot dogs, braised short ribs with horseradish mayo and sweet onion); salads (this week: a Shrimp Louie); pasta (perhaps spinach and ricotta-stuffed shells, with a Caesar salad side), desserts (chocolate dipped strawberries, fresh pecan tarts) and soups — including cream of celery. And no, it’s not Campbell’s. With all the talk about the difficulties of permitting street food in Seattle, I asked whether it’s been tough to get a mobile restaurant off the ground. Nope, she said, taking me through the process. After submitting her initial plan at the state capitol — where “Labor & Industries is the building department for mobiles,” Julie says, “a really nice guy in Olympia walked me through the application and turned it around real quick.” She outfitted her truck with a deep-fryer, a dual-oven Wolf range with a flat grill and four burners, a char-broiler, full-sized commercial fridge, sandwich unit (for inserts), a half-freezer, a three-compartment sink, a hand sink “and a little counter space,” and headed to the Everett office of L&I. “They did the inspection and put a sticker on it,” and away she went. For now we can find her truck in Edmonds behind the Warren Medical Building at 21727 76th Ave. W, just south of Stevens Hospital (Tuesdays 11 a.m. to 2 p.m.); at the corner of Fourth and Dayton (Wednesdays 11 a.m. to 7 p.m.); and in the Bank of Washington parking lot (off the corner of Fifth and Dayton). “I just drove around Edmonds, deciding where I wanted to be,” Julie recalls of her search for locations. And when she found a well-traveled corner at Fourth and Dayton, close to the Edmonds ferry terminal, “I went to the building’s owner, Pat McDevitt, and said, `I want to be in your parking lot.’ He said, `OK, that sounds like fun'” Still incredulous, she notes, “I didn’t even know him!” And get this: she’s not even paying for the privilege. Nice! When the branch manager at the nearby Bank of Washington — a Wednesday-lunch regular — heard she was looking for another site, he offered a slot in the bank’s parking lot on Saturdays. “He doesn’t charge me. Neither does the guy at Stevens Healthcare — and he’s got 47 properties.” Some of which may soon host Here and There. 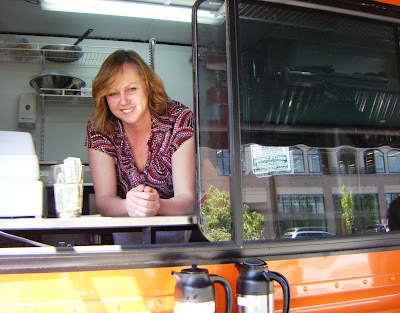 Recalling the days when parking-lot espresso stands were an anomaly, and imagining how many street-food vendors we may see in the future — given the growing trend — I asked Julie, “So, how’s business? 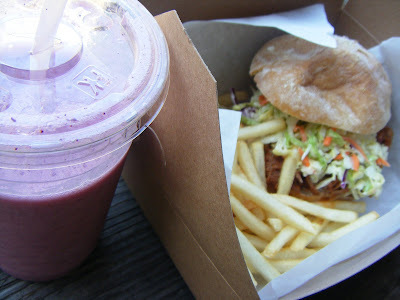 Now tell me, do: What do you think of this street-food movement? And what restaurants would you like to see taking their product to the streets?